Sam Houston State University’s Thomason Special Collections will commemorate the sesquicentennial (150th anniversary) of the Civil War with Ed Williams, who will discuss his book on Texas’s participation in the war on Friday (Nov. 9). The book talk will begin at 6 p.m. in the Thomason Special Collections, on the fourth floor of the Newton Gresham Library. A tour of the Thomason Room’s many unique collections will follow, according to Felicia Williamson Thomas, head of Thomason Special Collections. 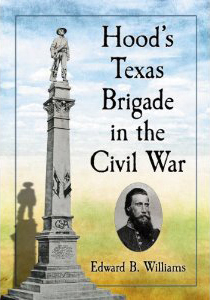 Williams is the author of Hood’s Texas Brigade in the Civil War, published in July by McFarland and Company, which chronicles John Bell Hood’s Texas Brigade, from its formation through postwar commemorations, providing a soldier’s-eye view of the unit. Of the many infantry brigades in Robert E. Lee’s Army of Northern Virginia, Hood’s Texas Brigade earned the reputation as perhaps the premier unit, fighting from 1862 until Lee’s surrender at Appomattox, in most of the major campaigns in the eastern theater and several more in the western, according to Williams. The brigade became distinguished for its fierce tenacity and fighting ability and suffered some of the war’s highest casualties. “The goal of this event is to share an important episode in Texas's history with the SHSU and Huntsville communities and to highlight the Thomason Room as a source of historical research,” Williamson said. “This book is of interest to local historians and Texas history enthusiasts. “We are inviting local historical and heritage organizations and history buffs, young and old, to come and participate in the discussion of an important time in Texas state history,” she said. Williams, a military historian and retired captain in the U.S. Marine Corps, earned his doctorate at Texas A&M University. Williams is the author of Rebel Brothers: The Civil War Letters of the Truehearts and has published articles in America’s Civil War, Aviation History, Southwestern Historical Quarterly, and Quarterly Journal of Military History. The Thomason Special Collections maintains a large collection of rare books and manuscripts with a focus on criminal justice, local Walker County history, special authors and beat poetry and maps. This event is the first of what Williamson said she hopes will be a semiannual event. “We’d love to have students visit the Thomason Room more and more and are planning to have at least one event per semester that will open our doors to new audiences,” she said. Attendees are requested to RSVP by Nov. 6. For more information, or to RSVP, contact Williamson at 936.294.3290.